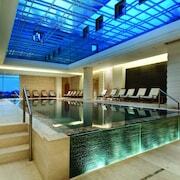 In addition to a full-service spa, Hyatt Regency Pune features an indoor pool and a health club. The hotel offers a restaurant, a coffee shop/café and a snack bar/deli. A bar/lounge is on site where guests can unwind with a drink. Public areas are equipped with complimentary wired and wireless Internet access. Business-related amenities at this 5-star property consist of a business centre and a limo/town car service. Event facilities measuring 20451 square feet (1900 square metres) include conference centres. This luxury hotel also offers a sauna, spa services and tour or ticket assistance. For a surcharge, the property provides a round-trip airport shuttle (available 24 hours) and an area shuttle. Complimentary self-parking and valet parking are available on-site. Hyatt Regency Pune has designated areas for smoking. This family-friendly Pune hotel is located near the airport, within 2 mi (3 km) of Aga Khan Palace and Phoenix Market City. ABC farms and Muttha Towers are also within 2 miles (3 km). This hotel features a full-service spa, a restaurant and an indoor pool. Free WiFi in public areas and free valet parking are also provided. Additionally, a health club, a bar/lounge and a coffee shop/café are on-site. All 222 rooms feature thoughtful touches such as pillow menus and bathrobes, plus free WiFi, free wired Internet and Smart TVs with cable channels. 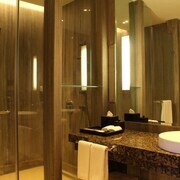 Other amenities available to guests include 24-hour room service, premium bedding and rainfall showerheads. 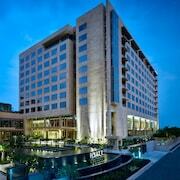 Hyatt Regency Pune offers 222 forms of air-conditioned accommodation with laptop-compatible safes and free newspapers. Beds feature premium bedding. A pillow menu is available. 55-inch Smart televisions come with cable channels. Bathrooms include a combined bath/shower unit with a rainfall showerhead, a complimentary bathrobe, complimentary slippers and complimentary toiletries. Guests can surf the web using complimentary wired and wireless Internet access. Business-friendly amenities include desks and telephones. Additionally, rooms include complimentary bottles of water and coffee/tea makers. A nightly turndown service is provided. The Cafe – This restaurant serves breakfast, lunch and dinner. Open daily. Zeta – This bistro specialises in local and international cuisine and serves lunch and dinner. Open daily. Gourmet Avenue – On-site delicatessen. Open daily. Arogya Spa has 6 treatment rooms, including rooms for couples. Services include facials, body wraps, body scrubs and body treatments. The spa is equipped with a sauna and a steam room. A variety of treatment therapies are provided, including aromatherapy and Ayurvedic.